← How to save WMF to PCX flexibly? If there is some useful text information in an image and you need to extract them into PDF document, you may need to choose a kind of application which can recognize the characters in image files and also has the ability to convert image to searchable PDF document. So you can choose Image to PDF OCR Converter as your tool. Image to PDF OCR Converter is one product of VeryPDF which also has more products in its website. To download this application, you can access its homepage: http://www.verypdf.com/app/image-to-pdf-ocr-converter/index.htmlto get its evaluation version. Then you need to install this application on your computer. After the installation, you are able to launch and use the application. Please see the main user interface of Image to PDF OCR Converter in Figure 1. You can add the image file to be converted into the file list of the application by directly dragging and dropping. Or you can click “Add File (s)” button to open file picker window from which you can choose the document you need. When you successfully add the image into the application, you can click it and see the preview in preview frame. Then please click “Setting” button to set parameters for the target file in popup dialog box. The most important thing you need to do is to click “OCR” tab and check “Use OCR” option. When you click on “OK” button, it will return to the interface of Image to PDF OCR Converter. Please click “Make PDF”. There are two options appearing beside the button: “Convert all image files with default options” and “convert selected 1 file to one PDF file”. Please choose the one you need and the dialog box “Save as” will pop up, in which you can save the image to searchable PDF document and run the conversion. Please see it in Figure 2. To convert image to searchable PDF, you can also use the command line method. 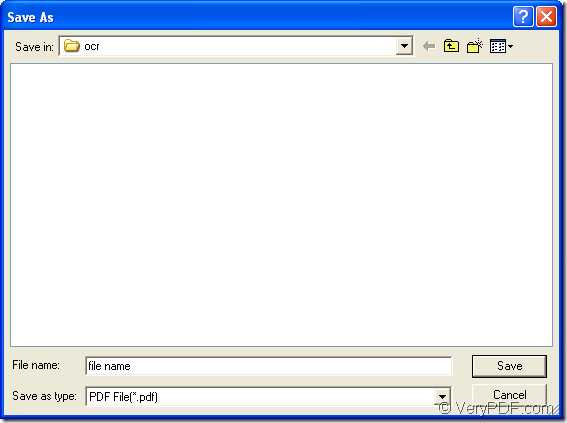 The application you can take is Image to PDF OCR Converter Command Line. You can also download or purchase the application in the homepage of Image to PDF OCR Converter mentioned above. At first, you need to open MS-DOS interface for inputting your command line. Please click “Start”—“Run” to open “Run” dialog box and input “cmd” in “Open” combo box and click “OK” button. 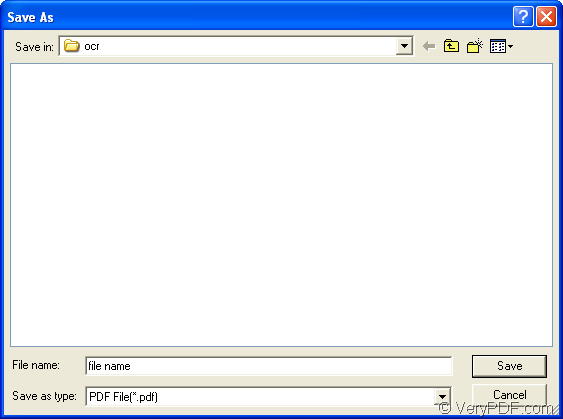 In the example, image2pdf stands for the called program. When you call it, please find the executable file img2pdf.exe in unpacked package of the command line application on your computer. -x 1 is to create searchable PDF document. –o C:\target.pdf stands for the path of output file and C:\source.tiff stands for the path of input image. At last, please click “Enter” button on the keyboard to run the conversion. The target file will be automatically saved in the specified location. If you have any other questions about the application or the conversion procedure, you can leave us a message or come to our live chat support. How to change scanned eBook to text type eBook for better reading effect? This entry was posted in OCR Products and tagged image to searchable PDF. Bookmark the permalink.